POLICY NOTE 16 • JULY 2013 RESETTLEMENT AND FOOD SECURITY Valerie Mueller T he average smallholder farmer in Malawi is tasked to feed a family of five on a farm of less than one hectare in size (NSO, 2008). The intensification of land through, for example, fertilizer use plays a prominent role in Malawi’s policy to increase the productivity potential of smallholder farmers. With the population almost doubling in the last twenty years (NSO, 2008), additional measures are needed to accommodate the growing number of young, landless Malawians and relieve land constraints for the remainder. The government of Malawi with financial support from the World Bank created a land reform project to address exactly this concern in 2005. The Community-Based Rural Land Development Project (CBRLDP) targets households facing severe land shortages, to provide them opportunities to obtain larger farms in adjacent communities. To date, the program has 15,000 participating households. 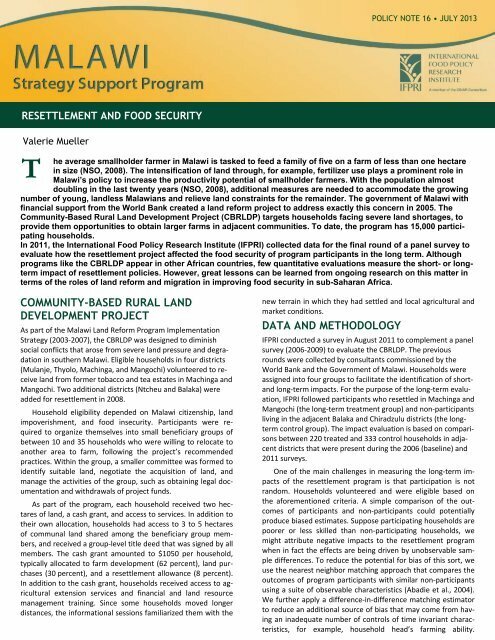 In 2011, the International Food Policy Research Institute (IFPRI) collected data for the final round of a panel survey to evaluate how the resettlement project affected the food security of program participants in the long term. Although programs like the CBRLDP appear in other African countries, few quantitative evaluations measure the short- or longterm impact of resettlement policies. However, great lessons can be learned from ongoing research on this matter in terms of the roles of land reform and migration in improving food security in sub-Saharan Africa. COMMUNITY-BASED RURAL LAND DEVELOPMENT PROJECT As part of the Malawi Land Reform Program Implementation Strategy (2003‐2007), the CBRLDP was designed to diminish social conflicts that arose from severe land pressure and degradation in southern Malawi. Eligible households in four districts (Mulanje, Thyolo, Machinga, and Mangochi) volunteered to receive land from former tobacco and tea estates in Machinga and Mangochi. Two additional districts (Ntcheu and Balaka) were added for resettlement in 2008. Household eligibility depended on Malawi citizenship, land impoverishment, and food insecurity. Participants were required to organize themselves into small beneficiary groups of between 10 and 35 households who were willing to relocate to another area to farm, following the project’s recommended practices. Within the group, a smaller committee was formed to identify suitable land, negotiate the acquisition of land, and manage the activities of the group, such as obtaining legal documentation and withdrawals of project funds. As part of the program, each household received two hectares of land, a cash grant, and access to services. In addition to their own allocation, households had access to 3 to 5 hectares of communal land shared among the beneficiary group members, and received a group‐level title deed that was signed by all members. The cash grant amounted to $1050 per household, typically allocated to farm development (62 percent), land purchases (30 percent), and a resettlement allowance (8 percent). In addition to the cash grant, households received access to agricultural extension services and financial and land resource management training. Since some households moved longer distances, the informational sessions familiarized them with the new terrain in which they had settled and local agricultural and market conditions. DATA AND METHODOLOGY IFPRI conducted a survey in August 2011 to complement a panel survey (2006‐2009) to evaluate the CBRLDP. The previous rounds were collected by consultants commissioned by the World Bank and the Government of Malawi. Households were assigned into four groups to facilitate the identification of shortand long‐term impacts. For the purpose of the long‐term evaluation, IFPRI followed participants who resettled in Machinga and Mangochi (the long‐term treatment group) and non‐participants living in the adjacent Balaka and Chiradzulu districts (the longterm control group). The impact evaluation is based on comparisons between 220 treated and 333 control households in adjacent districts that were present during the 2006 (baseline) and 2011 surveys. One of the main challenges in measuring the long‐term impacts of the resettlement program is that participation is not random. Households volunteered and were eligible based on the aforementioned criteria. A simple comparison of the outcomes of participants and non‐participants could potentially produce biased estimates. Suppose participating households are poorer or less skilled than non‐participating households, we might attribute negative impacts to the resettlement program when in fact the effects are being driven by unobservable sample differences.  To reduce the potential for bias of this sort, we use the nearest neighbor matching approach that compares the outcomes of program participants with similar non‐participants using a suite of observable characteristics (Abadie et al., 2004). We further apply a difference‐in‐difference matching estimator to reduce an additional source of bias that may come from having an inadequate number of controls of time invariant characteristics, for example, household head’s farming ability.